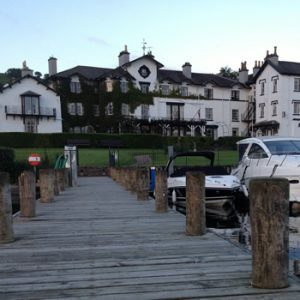 I’ve enjoyed a long association with the events team at Low Wood Bay Hotel near Windermere, and I was pleased when they booked me to DJ at the wedding of Manchester couple Will and Jess. After setting-up, I spent time chatting with Gemma from the Low Wood who revealed the hotel is closing in January 2017! She saw the shocked look on my face and quickly added its only closing temporarily, to allow for a major refurbishment including an extension and new access road. It is already one of the largest and best-kept hotels in The Lake District, so I look forward to the 2017 relaunch. The function room at The Low Wood can be tailored to the size of the event, using huge partition walls which fold out to reduce the size of the room when necessary. The size of the room, in comparison to the number of guests, is an important factor towards building a great party atmosphere, so worth considering when looking at possible venues for your wedding. For Will & Jess, the room was 3/4 sized which was ideal for the number of guests as the short video below shows. Their choice of first dance was a track by the American rock band, Foo Fighters. They had found a lovely acoustic version which set the scene for a great night. Later in the evening, despite playing a broad mixture of different music, I discovered it was US Indie Rock that seemed to keep the dance floor busy, and the guests requested some classics that I rarely play including Teenage Dirtbag, Stacey’s Mom, and Pretty Fly for a White Guy. I was very happy to play these and they created a great atmosphere and an enjoyable end to the big day.